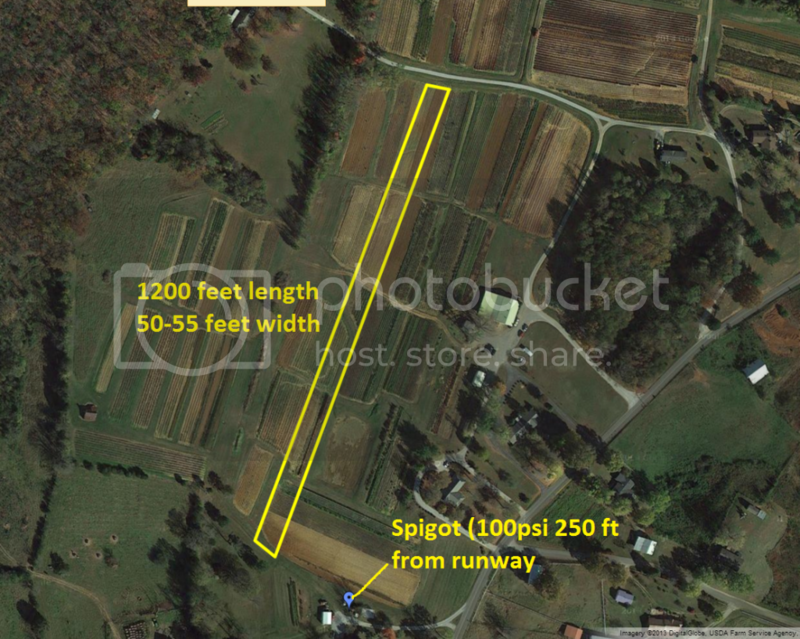 I'm wanting to install a relatively cheap/inexpensive irrigation system for my grass runway, of which I have attached a photo of. The google map photo is old, as I have it completed as of now. I need all the help I can get, as this is my first foray into underground irrigation! I'm not looking for any type of computerized/automated system right now, I plan on just having a on/off valve and no other electric valves at this time. I may go ahead and run the wiring when I dig my trench, but as of now I want to keep it all mechanical valves. The line I'm tapping into has a PSI of right under 100. I know that's pretty high. I spoke to the local Ewing store and they said they say it's possible by using 3 zones, but didn't specify how many sprinklers per zone or any details. As I said, I'd like to run the pipe and sprinklers up the left side of the runway and just have them set at 180 degrees, unless someone tells me otherwise. Any help you can give is greatly appreciated! EDIT*** I just realized that won't work. It would be impossible to run the sprinklers in series with the valves on because when the last zone was turned on, all sprinklers would be getting water. Pressure is meaningless without flow. High pressure is good, and it gives you options. To completely cover the 50-foot wide strip from heads off of one side puts you into the realm of big expensive athletic-field/golf-course heads, and you need a great deal of flow to make those work. Is this on city water? If so, what are the sizes of the main and water meter? I haven't been able to get the flow numbers yet, as I won't be there to measure until Saturday or so. It's on city water. I know the meter is 3/4, but not sure about the main line. I think the main is only an inch, but could be wrong. I wouldn't be against placing the sprinkler heads in the middle also if they were somewhat tough and flush with the ground. It's not like it's going to see that many operations on a frequent basis anyway. The weight of the tire is only around 300 lbs and would cross over in a split secondif they were ever ran over. This looks to be the work of several zones. If I were tasked to do this job, I might have a second water meter installed just as close as I could locate it to the tap on the water main, so that I could pull at least 30 gpm, and from there increase the pipe size to 2 inch. This is no little job to be dashed off as a bargain with ho-hum equipment and installation. You are watering over an acre, with the most distant head close to a third of a mile from the source. I would be recommending against putting anything in the runway itself. Strictly for cost reasons, along with improving system reliability, there are good reasons to look at installing a line of heads on either side of the runway. First, is that you can easily cover the 50-foot width with standard residential heads on either side spraying a 35 foot radius. Second, is that with two mainlines on either side of the runway, the flow can be split between the two lines, making for less flow in each mainline, and lower flow will allow for smaller zone valves (two standard zone valves cost less than one larger-size valve) and also reduce the effect of water hammer, which is an important factor when there are many hundreds of feet between your source and your zone valves. Another cost factor will be the control wire to the zone valves. Because of the distances involved, standard 18-gauge irrigation cable may have too much resistance for operating multiple zone valves at the distances involved. One can always increase the wire size, like using a single 14-gauge wire for a system common, but this may be a project that could be more economically done with what is known as "2-wire" control. That spends money on the controller and decoder modules, rather on lots and lots of copper wire. Sorry for taking so long to get back on here. I was able to get my flow rate and its right at 400 GPH, or 6.66 GPM. There is actually a 6 inch water line running perpendicular across/through the strip right on the bottom side of the dried up pond in the previous photo. This would probably be my best bet but was trying to shy away from getting another meter installed, but that's not a showstopper. Thanks again for your help so far in this! The water main crossing the area getting watered is going to be your best bet at doing the job in the optimal "big water" style. You might even be able to handle it with a single line of big heads off one side of the runway. Big Water means more expensive individual components, but less of them, so overall reliability increases. What's your closest power source to the runway? The power source is almost at the same location as where I have the spigot marked. There is actually a well (hand dug) only about 10 feet from where the spigot is marked also. It is 30 feet deep and used to feed the house back in the day. I don't have a clue on what the capacity or anything is in it, but we sometimes use a small submersible pump in the summer to water a garden and have never ran out yet. That was using a pretty low flow rate, so probably not a good indicator of what could come out. Also, from only being 30 feet deep, it probably wouldn't take much to drill another one out much closer to the runway. Where is your location, by the way? I ask because of plumbing code variations and freezing concerns. I'm in the southeastern portion of TN in a rural area, about half way between Nashville and Chattanooga. It still gets pretty chilly in the dead of winter, so freezing is of a slight concern. Codes wise...I haven't checked on anything with this but building codes wise, there's not a whole lot of it around here.